Most VFDs are supplied with a protection rating of IP20 (Finger proof). This normally requires that the variable frequency drive needs to be mounted in a floor standing enclosure or wall mounted panel, to increase the degree of protection. The reliable trouble-free operation of all industrial equipment is dependent upon operation in an environment for which that product was designed. The single most significant reason for the premature failure of a VFD controller is operation in excessive ambient temperature. The design of the enclosure in which the VFD is housed is therefore of critical importance. The following guide covers the basic calculations necessary to ensure that heat generated by a VFD can be satisfactorily transferred to the air surrounding the cubicle. When making the calculation, remember to take account of all power dissipated inside the cubicle, and not simply that generated by the VFD. Further, in the internal layout of the cubicle, where possible, avoid placing electronic components at the top (hot air rises! ), and where possible provide fans to circulate internal air.Remember, as a rule of thumb, an electronic product's lifetime halves for every 7°C temperature rise. The enclosure itself transfers the internally generated heat into the surrounding air by natural convection, or external forced airflow. The greater the surface area of the enclosure walls, the better is the dissipation capability. Remember also, that only walls which, are not obstructed (not in contact with walls, floor or another hot enclosure) can dissipate heat to the air. k = Heat transmission coefficient of the enclosure material (Wm-2 ºC-1). The enclosure is to be made from painted 2mm sheet steel having a heat transmission coefficient of 5.5 Wm-2 ºC-1. Only the top, the front and two sides of the enclosure are free to dissipate heat. In this case the dimensions of the enclosure are determined only by the requirements to accommodate the equipment making sure to provide any recommended clearances. The equipment is cooled by forced airflow. This being the case it is important is such arrangement to ensure that the air flows over the heat-generating components to avoid localized hot spots. pi = Air pressure at the installation. Typically, a factor of 1.2 to1.3 can be used to allow for pressure drops in dirty air filters. It is important to recognize that the non-sinusoidal waveforms, and variable frequency, associated with variable frequency drives, invalidate the basis for protection afforded by most electronic overload relays. The use of such devices on the mains supply of a variable frequency drive is also invalid. Please consult with the manufacturer before using any of these devices. Fuses should not be seen as an overload protection device; variable frequency drives regulate the current flowing in the system and fusing needs to be designed to cater for catastrophic failure within the VFD or a short circuit between cables. High rupturing capacity fuses (HRC) act as clearing devices for sustained high currents and are consequently well suited to this type of duty, and is commonly recommended by most VFD manufacturers. Typical fuse recommendations for three-phase variable frequency drives are given in Table 2. The use of chokes to facilitate the application of long motor cables is rare. It is usually simpler and more elegant to use a larger variable frequency drive rating. Because of charging currents, long motor cable runs can cause a reduction in the torque available from the variable frequency drive; this could also cause the variable frequency drive to trip due to excessive current normally experienced with smaller capacity variable frequency drives. The following guidelines give suggested limits for standard shielded cables. The capacitance of the cable is approximately 300pF/m measured from the three phases together to the sheath. This is typical of steel wire armoured cable (SWA) and similar, where the individual phase conductors are surrounded by a further insulating medium before being covered by the screen. For other values of capacitance the length limits are approximately in inverse to the capacitance. Note that individual separate phase conductors give lower capacitance, but may not be acceptable for EMC reasons. Cables where the screen is laid over the phase conductors and mineral insulated cables, are known to have much higher capacitance and should be treated with caution. The above cable lengths are for Gozuk VFDs. Please consult with the variable frequency drive Manufacturers before installing. Calculation of the necessary inductance of the choke is complex. However the following guidelines might be helpful. Estimate the cable capacitance (C), from one line to all others. If using standard iron-cored chokes, the inductance at the high frequencies involved will be rather lower than the specified 50Hz inductance. A good rule of thumb is to specify an inductance of twice that determined by this calculation. If 2Lmin < Lmax then any value between these limits can be used. If 2Lmin > Lmax then the variable frequency drive cannot operate with this length of cable and a higher rated variable frequency drive must be used. The factor 0.8 is a rough estimate of the fraction of the total losses dissipated in the choke. Note that the loss is proportional to the switching frequency so the lowest acceptable frequency should be selected. The value is not critical and variations of ±50% are acceptable. The power rating of the resistor should beat least 0.8P. Provision must be made for the resistor to dissipate this power without overheating itself or nearby equipment. Values of 100W per phase are not uncommon. A good rule of thumb is to ensure a total supply impedance of approximately 4 percent reactance. Where information about the supply is not known, it is good practice to fit line reactors of 2 percent. There is no easy solution for high supply impedance as power lines carrying VFD current need to be oversized, as do transformers used in order to minimize the impedance. This over sizing may need to be as high as five times that normally considerate adequate. Firstly we need to understand what happens when a motor decelerates to stop under a high inertia load. When the motor starts to decelerate and the load keeps on rotating the motor, the motor starts to act as a generator sending energy back to the VFD.With energy from the main supply and from the motor, now acting as a generator,the DC Bus voltage level starts to rise from approximately 560VDC to levels that will activate a DC Bus over voltage trip. Most variable frequency drives can sustain levels up to 780VDC before tripping. 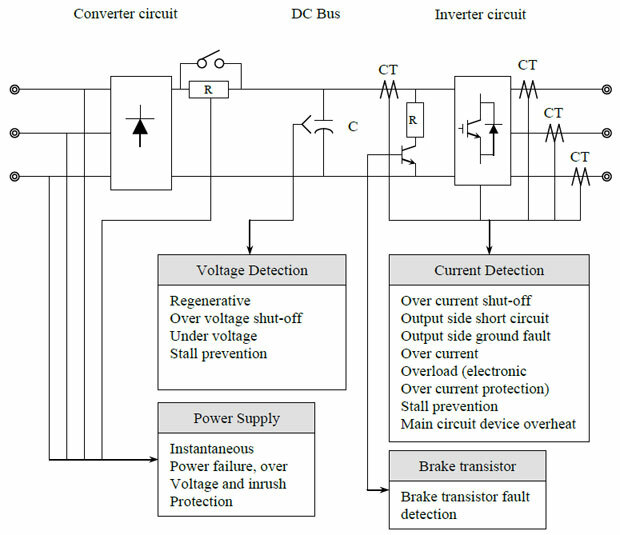 Some variable frequency drives equipped with internal braking circuits and resistors will control this rise in DC Bus voltage but only for a short duration. If a lengthy or heavy-duty brake cycle is required, it is best to fit external units, which could cope with the extra energy safely. To reduce the cost and physical size of VFDs, and the fact that very few applications require DC Bus braking, manufacturers only provide units with limited DC Bus braking capabilities. Users should consult with Manufacturers as to the capability of the units before installing them in these applications. Two important factors to consider are the required braking torque and the duty cycle of the application. If there is gearing between the motor and the driven machine, J is the value reflected at the motor shaft. As the energy regenerated is proportional to the square of the angular velocity, most of the energy in the system is concentrated at the higher operating speed, and is delivered to the resistor at the start of the deceleration. As the braking operates intermittently, the resistor can be selected from a range offering "intermittent" rather than "continuous" power absorption. Advantage an also be taken of the overload rating of the resistor by applying an overload factor, which will be derived from a set of cooling curves obtained from the manufacturer or supplier of the resistor. In this example,deceleration time is taken as 7 seconds, repeat cycle time 30 seconds. From typical data the overload factor is 2. For practical purposes, it can be assumed that 15% to 20% of energy dissipated during the regenerative braking is due to electrical losses in the motor and variable frequency drive, and mechanical losses in the motor and load, all of which assist the braking. In practice, using the recommended resistor value will result in extra braking torque available. However, the rate of energy feedback from the load inertia is determined by the rate of deceleration. A braking resistor must be installed in accordance with instructions provided by its supplier or manufacturer. The braking resistor should incorporate a thermal tripping device, which should be connected, to a trip release mechanism to stop the VFD. The following table is a guide of torque requirements in certain applications.